Enjoy restaurant discount at Airporthotel Düsseldorf! With your own unique Restaurant ID, you will receive the best restaurant deals. Click here for an overview of participating restaurants. Click here to have a look at Van der Valk Airporthotel's special menu for the Restaurant ID. No Restaurant ID yet? Sign up and receive your unique Restaurant ID number to make use of the special diner deals. Do you already have a Valk Account? In this case, your Restaurant ID number is in your account dashboard. Always your Restaurant ID with you? Download the Valk Exclusive App! Not possible for you to use our App? Visit our website. Login with your Valk account and go to your hotel dashboard. You will find your Restaurant ID on the right. 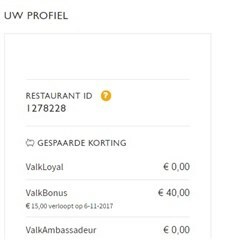 You can find your Restaurant ID in our Valk Exclusief App. Download the app for free and login with your Valk Account.